Indigo Fine Art Gallery: Honorable Mention! 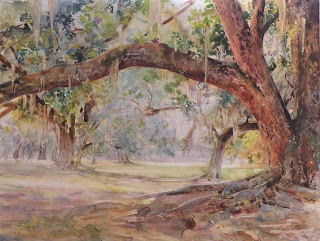 In December 13th's post, we mentioned that "Live Oak Canopy" (by Helen K. Beacham) would be in the gallery right after it's framed...well, it took a little detour in the meantime and won an Honorable Mention award at the Charleston Artist Guild's "Member Exhibition" on Friday night. The judge's comments included the following statement: "...This is a competent handling of a typical Southern subject that stands above the average! Its unusual palette, with autumn colors, has a luminescence with the earth tones, especially under the trees...."
Why not plan to come into the gallery and see it for yourself? Another one finds a home!